The Spiritual Mechanism of the Universe! 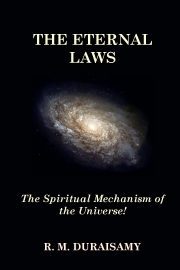 Description of "THE ETERNAL LAWS"
Three Laws comprise the “Spiritual Mechanism” of the World-Universe! The Law of Karma (Reciprocal Action), The Law of Attraction of the Homogeneous and The Law of Spiritual Gravity! Acting as a trinity, these Eternal Laws keep Creation in balance and perfection. They were instituted by God to ensure the preservation of Creation, and can thus be regarded as The Laws of God or The Will of God. In this discourse, the operation of these Eternal Laws is described, and the Key to living these Laws, as willed by The Creator, is therein revealed. The structure of Creation becomes visible, and questions about spiritual matters, such as reincarnation, rebirth and transmigration, the development of the human spirit and the concept of “Collective Karma”, all find their answers here. Crystal clarity thereby arises before the reader, and the Way to The Light of Truth becomes alive! Reviews of "THE ETERNAL LAWS"